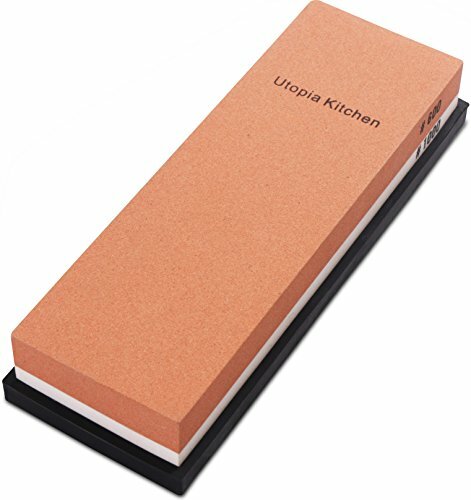 Get the most value for your money with Top-Rated Double-Sided Knife Sharpening Stone Multi-Colored - 600/1000 Grit! Double-Sided Knife Sharpening Stone keeps your entire steel and ceramic knives razor sharp with just a few pulls through the precision rods. Works on any blade size or style, including large kitchen and hunting knives. Please put the knife sharpener and knife beyond the reach of children. Works on ceramic and steel blades. Soak the stone in the water for 5 minutes, and then put it on a steady platform. Sharpening the knives with one or two steps is decided by the degree of blunt tool. Hold the knife at an angle of 10 - 30 °, grind the edge on the surface of stone back and forth with gentle pressure, and sharpen it until the edge sharp enough. After sharpening the tool, it needs to be honed with coarse grinding after half a year. Also depends on the specific situation. Use more gentle pressure, repeat step 1, and repair the edge until smoothly and keenly. Wipe it with wet cloth or rinse it with water after sharpening the tool, and then dry it. Clean the stone surface with a soft brush and put it in the air. Use the whole surface of stone to keep the consistency when sharpening knives. Protect the stone well and avoid it falling from the height. Sharpening result would be much better using with sharpening oil.